When I visited Austin, Texas for the first time, all that I had in mind was one thing: to eat, and I certainly ate to my heart’s content (and then I ate some more). I knew that it would be impossible to only eat for four days straight, so I decided that I wanted to try to squeeze in a little bit of sightseeing around the city as well. 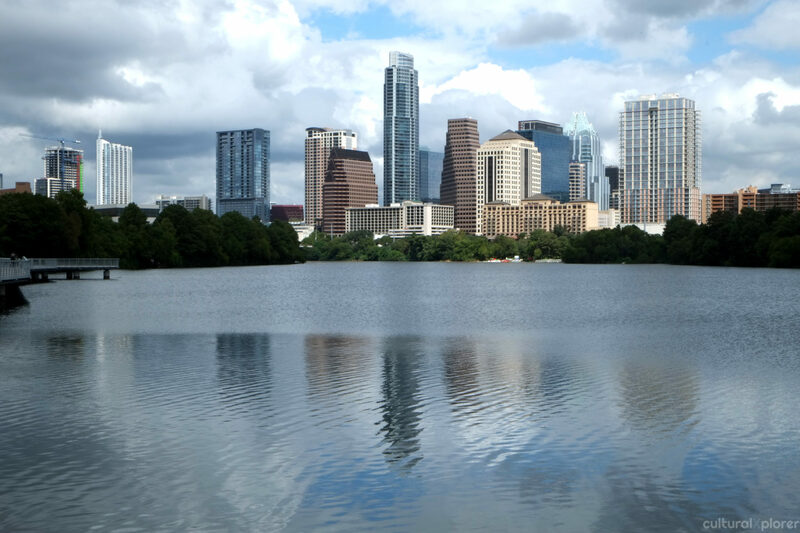 If you are planning a trip to Austin, here are some suggestions of things to do in the city that do not involve eating! Created in 1998, the Greetings from Austin mural is one of the most popular murals in the city and definitely should not be missed during a trip to Austin. The mural was created by Todd Sanders and Rory Skagen and has been the backdrop of countless photographs and has been in numerous web, television, and print advertisements. I already know what you are thinking – ‘travel to Austin and go to the movie theaters? Yeah right.’ Typically, I would not be inserting a movie theater on a list of things to do when visiting a city, however the Alamo Drafthouse is more than just a trip to the movies, it is an experience. Born in the downtown Austin in the late 1990’s, Alamo Drafthouse markets movie culture through their love of cinema, and they are very serious about their movies. As a huge movie buff myself, I love everything about how serious Alamo takes their movies. They have two very specific rules that patrons must abide by: The first being that you are not allowed to talk or text during the movie, or you will be kicked out without a refund (this applies to celebrities and non-celebrities alike). The second rule is that you will be denied entry if you try to enter the theater after the movie has started, but hey, they serve food and beer, and they do not have ads before any of their movies, so that helps. I randomly came across the 360 Bridge Overlook when doing some blog researching before my trip to Austin, and I thought to myself, “Wow! I want to go there”, and I am so happy that I did. The 360/Pennybacker Bridge Overlook boasts stunning views of the 360 Bridge, Lake Austin, and beautiful natural scenery. Parking: Technically there is no parking at the Overlook, however there is a little area where you can park near the entrance of the path that leads to the overlook (but proceed with caution as there are signs surrounding the space warn you not to park there, and I ended up deciding to take a chance by parking in the spot despite the sign.) While I would never recommend doing anything illegal, you have to decide whether you think it is worth the risk. Austin is home to the largest bat colony in all of North America. Every year, over 1.5 million Mexican free-tailed bats migrate to the city of Austin from central Mexico and make their home underneath the Ann W. Richards Congress Bridge. According to Free Fun in Austin, the best time to view the bats is between late August and early September. I visited Austin in mid-September and went to go view the bats, but unfortunately I only saw a few of them come out from underneath the bridge and by time they did show up, it was too dark to capture them on film. It is no secret that I am a fan of street art. I have photographed street art across the world in places like Amsterdam, Chicago, Brooklyn, Queens, London, Brussels, Florence, and Rio de Janeiro. When I found out that Austin had a large collection of street art at the Hope Outdoor Gallery (aka the Baylor Street Graffiti Park), I jumped at the chance to go and see some artistic masterpieces in person. The gallery is unlike anything I have seen before; at three stories high, the outdoor gallery is the largest of its kind in the United States. Very much like places that host street art all around the world, the work is constantly evolving as artists come in and create new pieces over existing pieces, which means that something you see this year, may not be there the next year. It is a fun space to go and create some interesting pictures, or even paint on the walls yourself! One thing that there is no shortage of in Austin (other than food) is live music. You can literally find live music everywhere: at bars, at restaurants, in the park, you name it. Every single place that I went in Austin, I could hear music around me. If you are looking for some great live music in Austin, check out this Texas Culture Guide to Austin’s 9 Best Live Music Venues and the up-to-date live music guide on 365 Austin. One place that I certainly did not expect to enjoy as much as I did during my trip was a visit to the Texas State Capitol Building. Built in 1888, the Texas State Capitol Building is home to offices and chambers of the Texas Legislature and is also home to the Office of the Governor. Some of my favorite parts of the Capitol Building included the beautiful dome, which is modeled after the the dome of the Capitol Building in Washington, D.C.; the floor of the Rotunda, which has six seals that represent the former flags of Texas; and the House of Representatives, which has a beautiful balcony overlooking row after row of brown leather chairs. I love ‘escaping the city’ when I travel by visiting local parks. One of the best and most well-known parks in Austin is Zilker Park, a 351-acre park that is home to the Barton Springs Pool, the Zilker Botanical Gardens, the Austin Nature and Science Center, the Zilker Hillside Theater, the Umlauf Sculpture Garden and Museum, and a number of spaces for sports enthusiasts. Although I did not get a chance to visit the famous Barton Springs Pool during my trip to the park, I did have a chance to walk around the beautiful Ann Roy Butler Hike and Bike Trail (Town Lake Hike) that stretched ten miles around Barton Creek and the Colorado River. One of the last places that I visited during my trip to Austin was the Boardwalk at Lady Bird Lake, a scenic 1.3 mile elevated boardwalk with stunning views of the Austin skyline and Ladybird Lake. Opened in 2014, the Boardwalk provides a 14-foot-wide path between Roy G. Guerrero Metropolitan Park and Zilker Park and is ideal for bikers, walkers, and joggers who want to enjoy fresh air and beautiful views. Have you been to Austin before? What are some fun things to do in the city that do not involve eating? I have heard Austin is a very cool city and I can see why! I do want to go there to eat but Its good to know there is more to do. Love the bridge picture! Bats? oh no thank you lol. I love visiting parks when I travel to a new city and definitely love street art. I never knew Austin had so much street art. I will definitely have to try and visit someday! I have only been to Austin a couple of times, but I love it. I haven’t been to the 360 Bridge Overlook. I will have to check that out the next time I am there. Thanks! I’d love to visit Austin, TX. It sounds like there is so much to see and do in that city. I’m not a fan of high temperatures though, so I’d probably only want to visit and not necessarily live there year round. I’ve never been to Austin and I would love to visit all these places – except the bat thingy. I don’t do bats – they are jut creepy to me. I love the photo of the bridge. Looks like you had a really good time. I’ve never been to Texas but this looks fun. I’ll be bookmarking this just in case I ever go! Yes Miles, there are some great things to do outside of eating! The husband and I have always wanted to catch a movie at one of the Alamo Drafthouses. The only problem we would have is that we like to whisper to each other during movies! Ya know, I have never even been to Texas, let alone Austin! But now, I definitely see that changing in my future. Texas is such a huge state Mistee and my first trip was definitely a good trip. I hope that you can get there and I hope that I can get back there! You MOST DEFINITELY should eat Marielle! I was in Austin with my husband and we actually did watch the “bat” show. To be honest at first it was slow but once they got going it was amazing! We also went to the Whole Foods flagship store. It was amazing. Looks like fun. I have only been to Texas for conferences so I have not gotten to explore much. Would lvoe to go back! I have always been curious about Austin, Texas. Thanks for sharing your travel adventure! Love it!